The main menu screen displays your major gaming options. RACE COMPUTER Compete with up to three other computer-controlled racers on a track of your choosing. Select this race when you're just looking to relax and practice your skills. See details here. RACE CIRCUIT The most involved of all three race options, a circuit lets you compete in a series of races against an entire field of computer -controlled racers. Think of this as your "career". More details here. RACE FRIEND Compete against another player on a track of your choice. This option lets you and a friend race on the same computer viewing the race on a split screen. 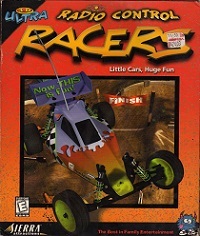 Computer-controlled racers may be included as an added challenge. More details here. PREFERENCES This button lets you change certain game settings. See below for details. WEB SITE This website is no longer in existence. When clicking on the web site button, it used to point your web browser to the 3D Ultra: RC Racers web site. There you could find the latest game information, a players area, and links to other 3D Ultra games. EXIT Click on the Exit button if you wish to exit the game at this time. You are immediately returned to your computer's desktop. Almost every aspect of RC Racers can be customized. The Preferences screen is broken up into four windows: Race Options, Controls, Graphics, and Sound. When you have finished making your selections, click on Save to record your changes. You can also click Reset to change the settings to the way they were when you first installed the game or click Cancel to cancel any changes you've made and return to the Main Menu. POWER-UPS Turn power-ups on for a wild race fraught with hazards such as oil slicks and homing missiles. Turn power-ups off for a no nonsense race of pure skill. See details on power-ups here. RACE TYPE Choose whether you want races to end after a certain number of laps or after a set amount of time. RACE LENGTH Click on a number to select the number of laps (or minutes, if you've selected time-based races) for each race. COMPUTER OPPONENTS Select the number of computer-controlled drivers you wish to race against in a Race Computer race. For a solo race without competition, choose zero. COMPUTER OPPONENTS IN RACE FRIEND When racing a friend, you may choose to have additional computer-controlled racers participate by selecting On. COMPUTER VEHICLES Choose whether you want to compete against a single car type or a random selection of car types in a Race Computer race. PLAYER Click on Player 1 or Player 2 to select which set of controls you wish to change. CONTROLLER TYPE You may race your car using a keyboard, mouse, or game controller (such as a joystick). Indicate which of the three devices you intend to use by clicking on the appropriate picture. CONTROLLER INPUT CONFIGURATION The default settings for the currently selected device are shown on the right side of the screen. To customize these settings, click on the Forward, Brake/Reverse, Left, or Right control box and then press the key or button that you want to use for this control. Note that you cannot change the mouse controls (nor control the vehicle's speed when using the mouse). GAMEPAD Click on this box if you are using a game pad controller. FORCE FEEDBACK Click on this box to enable a force-feedback joystick. TUNE Press the Tune button to display your tuning options. This screen lets more advanced players set their key controls and joystick/mouse inputs with greater precision. click on the Back button found at the bottom of the screen to exit the Tune screen. AMBIENT ANIMATIONS Click on the On box to enable background animations. These animations have no direct bearing on the race but they are fun to watch. BRIGHTNESS You may adjust your screen brightness using this slider bar. SCREEN SIZE The game may be viewed in three separate resolutions: 640 x 480, 800 x 600, and 1024 x 768. PLAYER NAME TAGS To keep track of your racer (and those of your competition), select On to make player name tags visible. Set the volume on the various sound components using the slider bars provided. Moving the slider bar all the way to the left turns off the sound.